Last month we wrote about our plans to go to Ministers’ Week. We have an article on that meeting in the latest South African Torch. Easter is a very special time in South Africa. Most churches have big gatherings. The Churches of Christ in KwaZulu Natal (our province) will be gathering at Gingindlovu which is about a 3-hour drive from home. We will leave early on Friday morning to arrive for the all-day service. It is scheduled to start at 9:00 am and finish about 3:00 pm with messages on the Seven Last Words of Jesus from the cross. After supper there will be a worship service. On Saturday there will be lessons and a worship service. The minister who was asked to bring a lesson for the entire group has asked Michael to take his place. He has had some health issues and doesn’t feel he can do it. So Michael is preparing a lesson this week. After Michael’s lesson the people will be divided into groups and there will be lessons for men, women and youth. In the afternoon there will be meetings and then there will be an all-night service. Sunday we will have a church service and then a big meal before everyone returns home. April is a big birthday month for our family. Sean, baby Michael, Dawn, John, and Gabriella all have birthdays this month. It looks like this year we will have three parties, but all are pretty low-key as everyone is so busy. Rebecca’s wedding is the 4th of May so she and Dina and Sean are busy getting that all organized. Diane and Dina are making bridesmaids and flower girl dresses. Gabriella is busy finishing her high school studies and needs to be done by the end of April. Michael and I have both been to the doctor this month. Michael went for check-up and he has no problems. He will see the cardiologist the first week of May to have his annual checkup. I had been having a lot of pain from what is, apparently, a spur in my heel. I think from walking awkwardly because of that pain, I developed severe back pain. Fortunately, the doctor was able to prescribe a medication which has really helped so I am feeling a lot better. Pray for the Easter meetings and for the preparations for the wedding. We have been keeping busy. The weather has been hot and humid so it isn’t easy to do much that involves physical exertion! We have a small air-conditioner in the office so it is our favorite place right now! The day care center is operating with four teachers this year. We have to have so many because two of the teachers are doing a training course and have to be away part of the time. When they are away the other teachers (who have not been for training) have to be there to care for the children. It is not ideal, but we don’t have any other solution at present. We need the teachers who have training! Pray for guidance for us! The Seniors’ Club is going well. The people certainly enjoy getting together and sharing time with one another. Because it has been so hot, they have not been doing much that requires physical activity. The last week of February Steve Caulley, a colleague from Kimberley came to Port Shepstone by bus. He had surgery on his shoulder recently so he isn’t driving. Steve and Brenda will be returning to the United States permanently later this year. A church about 75 miles from us invited him to come for a special farewell service. He arrived here on Friday morning and he and Michael traveled to the church on Saturday. They stayed over one night. The rain came down in torrents that night. The noise on the tin roof of the building made it almost impossible to hear what was going on! However the church gave him a nice farewell and presented him with gifts. He returned to Kimberley on the bus on Monday. We are busy getting ready for the annual Ministers’ Week. This is a time when ministers and their wives from all over South Africa meet for teaching, worship and fellowship. This year it will be in Wellington – near Cape Town. We decided the only way we could make the trip of over 1000 miles was to fly so we will leave early on Sunday morning from Durban. The 2-hour flight will get us to Cape Town in plenty of time for the first service in the evening. Michael will be leading the communion service that night. I have been asked to prepare lesson(s) for the ladies so I have been working on that. They haven’t said how many lessons or when they will be. We will be staying with friends who live on a farm just a few minutes’ drive from the conference center. The family is doing fine. The children are growing. The 7 and 8 year-olds (three of them) are all losing teeth at a rapid pace! Michael, at 10 months, is crawling and getting around very quickly! The school children (and the teacher) are looking forward to a 2-week school break between terms. Rebecca started a new job recently and is preparing for her May 4th wedding. Diane is making bridesmaids dresses for the wedding too. Steve Caulley spoke to the congregation when they invited him for a farewell. He and his wife, Brenda, will be returning to the United States permanently later this year. A VERY MERRY CHRISTMAS to you from hot, humid South Africa. We arrived safely back in South Africa on December 12 after our flights from Minneapolis to Boston, then from Boston to Amsterdam, and (a very bumpy flight) from Amsterdam to Cape Town. Our flight landed in Cape Town too late to catch a flight to Durban so we stayed overnight and left early the next morning. Our daughter, Dina, met us there with a pickup to transport us and all of our luggage home. Shortly after we got to our house, most of the rest of the family arrived and we enjoyed visiting and eating together. What a joy to see our girls, their husbands and six of the seven grandchildren. (John and Rebecca had to work so they couldn’t be here.) The little ones all grew a lot while we were away – especially Michael, who was seven weeks old when we left and almost eight months old when we got back. It did take a few days to get our body clocks back on the right time zone. I (Caryl) especially had a hard time with that this time. I don’t know if it was just tension or if I am just getting old! Fortunately, I am now almost back to normal sleeping and waking hours. We have been busy trying to get the house back in order and taking care of some urgent paper work. On Sunday, the 16th we went to a church about forty-five minutes from here for special services. Two of the ministers from KwaZulu Natal were ordained. 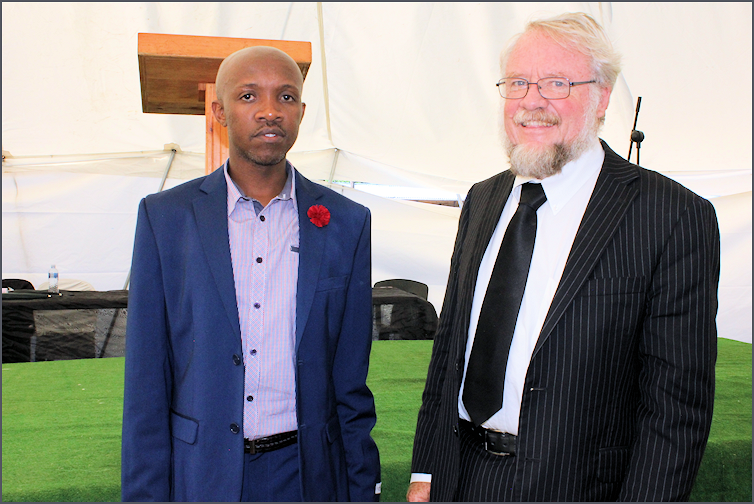 Two of the ministers from the Northern Cape came to participate in the service. We enjoyed seeing a lot of our Christian friends at that service. We were especially pleased to see Anna Songo, widow to minister Barnabas Songo. She is 80 years old and still in good health. Monday was a public holiday here and Sunday had been Chayah’s 10th birthday so the family gathered at their house to celebrate. We had a pizza party - the choice of the birthday girl. Grandpa made home-made ice cream to go with the cupcakes her mom made. It was a fun and relaxing day. The Christmas celebrations have begun. We went to a carols’ evening and nativity play last night. Chayah was Angel Gabriel, Erin was also an angel, Seanna was a shepherd and Matthew was the star of Bethlehem, complete with flashing lights. We will attend church at Umzumbe tomorrow and then join a small group to sing carols at a hospice in Port Shepstone on Monday. Our family Christmas will be on Christmas Day at Diane and John’s house. In July 2018 we returned to the US and over the past 5 months we have visited our supporting churches and individuals in Nebraska, South Dakota, Iowa, Minnesota, Wisconsin, Illinois, Indiana, and Ohio. We also attended the International Conference on Missions in Cincinnati and visited the Ark Encounter. Well, it has certainly been a busy time over the past few months. I just realized that we have not sent you any news since July! We have arrived safely in the US! Although there was still talk of the strike on Sunday evening, it sounded like it would only be from 7 until 8 on Monday morning. So we made the decision to leave early on Monday morning, giving ourselves sufficient time to make detours if necessary. Dina had stayed overnight with us to accompany us to the airport and take our car home. We left home at 7:30 and did not see any evidence of the strike – except a police presence along the road at one spot. We arrived at the airport by 9 and our flight was only at 2:40 p.m. We enjoyed a leisurely breakfast and walked around the airport and relaxed until time to check in and board the plane. Thank you for all the prayers. We had safe flights all the way. There was quite a lot of turbulence on all of the flights - which was apparently due to various weather conditions. We had lay-overs of about 7 hours in Cape Town and 2 hours in Amsterdam before arriving in Minneapolis on Tuesday afternoon. My sister, Sharon, and her husband, Dave, met us at the airport and transported us to Michael’s brother and sister-in-law’s house. We will be staying in Apple Valley with Larry and Marguerite for the next few months. We are adjusting to the 7 hour time difference and enjoying the summer weather. We thoroughly enjoyed the 4th of July celebrations and even managed to stay awake for the fireworks! We will be contacting churches in the next few days to organize visits so we can share with you about our ministry in South Africa. Again thank you to all who joined us in prayer for this trip. We certainly appreciate the words of encouragement we received from so many of you. Since we wrote our last email Dina and Sean’s eldest daughter, Rebecca, got engaged. She met Ruahn Beattie through National Sea Rescue Institute. He has been involved in some family activities for quite some time so we all know him quite well. They are planning a wedding next year – probably in May. We have been informed that the signatories on the Church of Christ Mission bank account have finally been changed. Now we have to get the check book sent to the treasurer and Michael’s responsibilities will be completely over. We are busy getting ready for a furlough. We have purchased tickets to fly from here to Cape Town and then on to Amsterdam and Minneapolis on July 2 and 3. We are arranging for people to take on our responsibilities for the day care center and preparing to leave our home here for a few months. This week we learned that there will be a nationwide shutdown of all roads by a labor union on July 2. They have called for trucks and private vehicles to block all of the roads so no traffic can get through. There was specific mention of blocking roads to airports. They are protesting the price of fuel and the recent increase in the Value Added Tax. At present the price of diesel for us is equivalent to over $4 per gallon. They are calling for it to be about $1.50 per gallon. The VAT is 15% and they want it reduced to 10%. If the strike goes ahead we will not be able to get to the airport and we assume that all flights could also be cancelled. Please pray with us that some agreement can be reached so we can make our trip as planned. March was a hectic month. We had the annual Ministers’ Week at the beginning of the month. It was held in East London which is about a 10 hour drive from here so we decided to travel by bus. The journey was fine except they didn’t have any meal stops so we quickly bought snacks whenever we could. When we got to East London we waited for one of the ministers to come and take us to the campsite. Unfortunately the organizers had under-estimated the number of people who would be there so they were short on housing. We stayed one night and then moved to a B&B where two of the other ministers were staying. That gave us more privacy and we could travel back and forth with them. It was a really good week of worship, fellowship and teaching. The plan was to do a handover of the mission finances at that meeting, but the new treasurer and the signatories were not present so that was not done. March was busy with funerals as well. Doreen Madlala, a member of the Umzumbe church and a foundation member of Magog Senior Citizens’ Club, passed away at the age of 88. The huge funeral was held in a tent at Umzumbe Bible Institute. The next week we attended the funeral of Mrs. Jethro Zobolo. Her husband, who was a minister, passed away in January. Her funeral was held on the Saturday of Easter weekend. During that week another member of the Magog Senior Citizens’ Club passed away. I think she might have been the youngest member of the club. She was an amputee and had attended a meeting quite recently and we did not know she was ill. We did not attend her funeral because of other commitments we had. The Easter weekend services were held at a school near Gcilima Church. There was a big crowd. The large tent was too small to hold the entire congregation, but when the rain started to fall people moved closer together and most of the people were able to get under shelter. People commented that the rain was a sign of God’s blessing on the meeting so no one complained. The first week of April we traveled to Kimberley with our pickup loaded with old financial records and stationery for the new treasurer. There were still some things that we could not complete because the new executive committee did not have all of the papers they needed to change the signatories on the bank account. However we were able to hand over all the records and stationery to the new treasurer. Michael still has the check book and will have to issue checks until they get the necessary papers and change the signatories at the bank. Our exciting news is that Baby Evans has arrived. Michael and I are staying at John and Diane’s for a few days to help with transporting Matthew to school and preparing meals for John and Matthew. 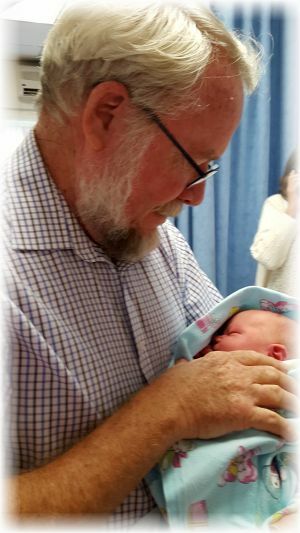 We are proud to announce that Michael Roger Evans (named after his grandpas) arrived on 19 April at 8:09 a.m. and weighed 3.53 kilograms (7 pounds 12 ounces.) Matthew is so proud and everyone is doing fine. For those who might be wondering - we did make it safely back to South Africa. We left Minneapolis (where the temperatures were well below zero) on December 29 and arrived in Cape Town (where it was very warm) on December 30. We stayed 2 nights with friends in Cape Town. Then we flew to Durban where Dina met us and brought us home. We have settled into our home again and it is good to be back. Our housing area had been without water for most of the last four months of 2017. The water woes continued into 2018 so we had to get water from a communal water tank. Finally residents had enough and contacted the press and took to the streets in protest. They also threatened court action and we finally got some results. We have had water most of the time since mid-January. We were blessed to have visitors in January. Michael's sister, Debbie, and her husband, Lynton, live in South Africa, so when their brothers, Duane and Larry, and Larry's wife, Marguerite came to visit all the siblings were able to be together on one side of the ocean. Friends, James and Marla Nicholson, also came and everyone was able to attend the wedding of Debbie and Lynton's youngest daughter, Jaclyn to Hugh van Niekerk. Then the nine of us enjoyed a 5-day vacation at Tembe Elephant Park in northern KwaZulu Natal. It was a never-to-be-forgotten experience that included accommodation in tents, food several times a day, and 2 daily guided game drives -with Nkosi, who was a wonderful guide! Unfortunately all good things must end and our visitors have returned to the US. It was a wonderful time and we made many memories! Now life is getting back to normal. We have attended the Umzumbe church and Michael has preached a few times. The day care center has reopened with new teachers and lots of new children. We have been back to the senior club and they welcomed us very warmly. 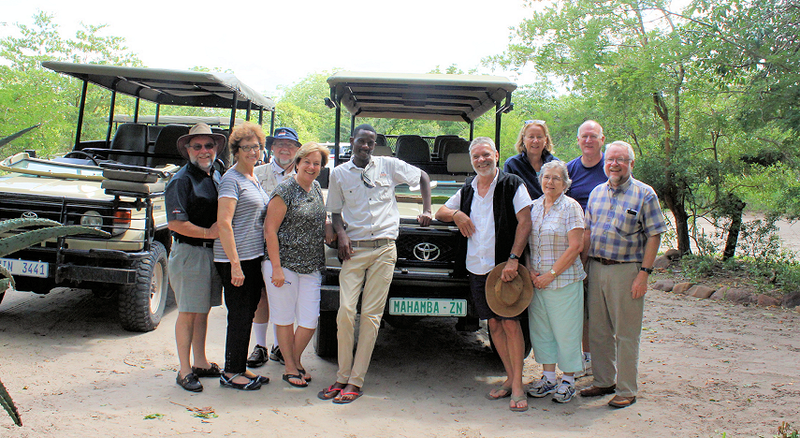 The photo is of the nine of us with our guide at Tembe Elephant Park. We have been able to spend some time with family. We traveled to Branson with Michael's two brothers and their wives for a few days of vacation. We had a wonderful time and enjoyed the programs and meals we had together. What a wonderful place to visit. They had started the Christmas programs and it really put us in the mood for the holidays! After Branson we went to The International Conference on Missions in Peoria. We had a meeting with our advisory board while we were in Peoria since it was a convenient place for our four board members to meet. They gave us some great advice and we were encouraged to refocus our ministry on more local ministries in South Africa and avoid the long trips. I picked up a "bug" somewhere in Branson or Peoria so have been coughing a lot the past week. I am feeling much better now and it seems Michael escaped the "bug" for whichWe will celebrate Christmas with the Stanleys on December 26. Then we will get our suitcases packed and leave the US on December 29. Our plan is to be back in South Africa for Michael's sister's daughter's wedding in January. Michael's two US brothers will also be at the wedding so all the siblings will be together - which doesn't happen often! Then we are looking forward to the birth of our grandchild number 7 to John and Diane in April. Later in the year we will come back to the US to visit more of our supporters. Picture of Michael and Caryl with their furlough display. Michael arrived in the US on 12 October. It is so good to be back together after 7 weeks apart. I spent most of the time with my sister and brother-in-law, Sharon and Dave. Sharon has some health issues and I was able to accompany her to a few doctors' appointments. It gave us a lot of time together - something we haven't had in a long time. 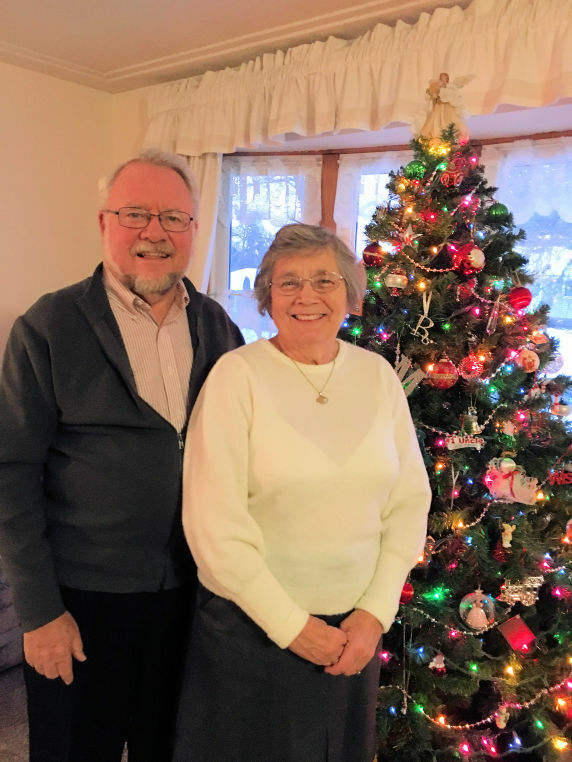 Just before he left for the Conference he was notified that Heather Kernan, a former fellow-missionary, had passed away. On Sunday when he arrived for the Conference church service, he was told that John had passed away. He thought that the person was confused, but then learned that indeed both Heather (age 88) and John (age 96) had passed away - her on Wednesday and him on Saturday. John had phoned about 6 months ago and asked Michael to speak at his funeral. He consulted with other church leaders and booked a flight to East London to be at the funeral on Tuesday. He had to fly from Kimberley to Johannesburg, stay overnight and then fly to East London. He missed the check-in in Johannesburg by 3 minutes and had to buy a ticket on another airline to get to East London. He arrived at the church for the 12 noon funeral at 12:05! He spoke at the funeral and then he spent the afternoon with John's daughter and family. They enjoyed reminiscing! We have now settled in with our friend, Richard Eckman, in Kimball, Minnesota. We will be visiting several of our supporters over the next two months. Our plans have changed a few times, but our plan is to return to South Africa at the end of December for some family events. Then we will return in mid-May to visit the rest of our supporters. Pray for safety as we travel and for God's protection over our family and house while we are away. I made the trip from South Africa to the US on August 24 and 25. The stop in Cape Town was 9 hours - a very long time to be in an airport! The real stressful time came when I went through passport control. He looked in my practically-new passport for my permanent residence visa and it wasn't there! He informed me that he was not going to let me leave the country. To make a long story short, he allowed me to have Michael send me a screen shot of the visa and then he stamped my passport and let me leave. Michael will bring the original visa with him so I will be able to get back into the country. He will also have to bring his visa with him. I arrived at 3 pm in Minneapolis and my sister and brother-in-law, Sharon and Dave, took me to see my sister, Juanita. She opened her eyes and gave me a huge smile when I arrived. I spent the next 3 hours with her, but she was in a lot of pain and didn't really talk to me. I went home with Sharon and Dave and early in the morning Sharon came to tell me that Juanita passed away at 6:30 that morning. A memorial service will be held October 16 when her granddaughter, Michael and other distant relatives and friends can be here. I have been staying with Michael's brother and sister-in-law, Larry and Marguerite, or with Sharon and Dave since then. Sharon and I have helped my niece and nephew sort some of the things in Juanita's apartment. Larry helped me get a car for Michael and me to drive for furlough. It is a 2010 Honda Accord. Dave is an expert in cars and he has checked the car thoroughly and he says it is in really good condition. I have done some mission work - contacted some churches to arrange speaking dates and prepared the next South African Torch f or publication. Michael has worked on the financial report and will meet with the finance committee in King Williams Town this weekend to finalize his treasurer's report. It is about 400 miles from home so our granddaughter, Rebecca, is going along to keep him company on the road. She will stay with her dad's sister who lives near there. When Michael gets back he will collect all of the reports for the annual conference and have them printed in a booklet for the delegates. Then he will start packing for his trip to the US and travel to the conference which will be held in Kimberley from October 1st to 6th. Pray for him as he travels and attends the conference. After the conference Michael will finish packing his suitcase and finalize things at the house for our absence. Our Community Watch will check on the house and we will have a garden service take care of the yard. Michael will fly to the US on October 11 and 12. Pray for God's protection over our house and for safety for Michael as he travels. Just a short note to up-date you on the latest plans. Our plan was to attend the annual church conference at the beginning of October and then travel to the U.S. to visit churches and report on our work and our plans for the future. A lot of our plans changed when we received news that my younger sister has been diagnosed with stage 4 cancer. I was advised to go and spend some time with her before Michael and I start visiting churches in late October. I will be flying to the U.S. on August 24. I will be staying with family in the Minneapolis/St. Paul area. Please pray for me as I make this trip on my own. Michael and I are busy working on his annual treasurer’s report. He will be meeting with the finance committee to finalize the report at the beginning of September. Please pray for him as he prepares the house for our absence, attends the conference and travels to the U.S. in mid-October. He will also hand over our responsibilities for our schools’ ministry and the day care center to members of the local church. Needless to say we are both a bit stressed with the financial report, the preparations for our travels and the thought of being apart for seven weeks at such a critical time. We look forward to seeing many of you over the next few months. June started with us going back to Hammarsdale where Michael served as minister for about three years in the early 2000’s. One of the youth had studied for a teaching degree through UNISA (University of South Africa, a correspondence university) and we were invited to her celebration party. She has been working as a teacher’s aide and has been offered a position at the school. We are proud of her achievements! We celebrated our 48th wedding anniversary on 7 June by going out for dinner. 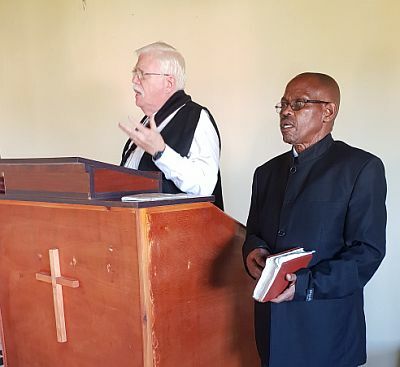 Michael had a Church of Christ Mission executive meeting in Kimberley in mid-June. We drove to Bloemfontein and stayed overnight. He had to get up at 1 in the morning to meet another committee member who arrived then by bus. In Kimberley we again stayed with our friends, Roy and Jenny Murray. Michael had meetings all day on Friday and Saturday. Saturday morning I went to the B & B where the other men were staying and made breakfast for them. I spent the rest of my time there visiting with Jenny while we knitted. On Sunday afternoon we went to see Steve and Brenda Caulley, fellow-missionaries who live in Kimberley. We had coffee and a nice visit. Steve is involved in writing and teaching Bible classes. The last weekend in June Michael went to Lusikisiki in the northern part of the Eastern Cape for evangelistic outreach meetings. I stayed with Diane and John. On Saturday I got sick and no anti-nausea medication seemed to help – not even an injection. By Sunday I was feeling better except for a nagging pain in my abdomen. I went to church and then the family (except Michael) celebrated my up-coming birthday with a lovely pork roast dinner. Michael came home on Sunday night and Monday we decided I should see my GP as the nagging pain had not gone away. After a brief examination she sent me to the hospital to consult a surgeon. He sent me for x-rays and a scan and then put me on intravenous antibiotics to fight the infection in my appendix. Tuesday morning he announced that it wasn’t doing the job and he was going to do surgery. He removed my appendix on Tuesday afternoon and released me from hospital on Wednesday afternoon. Michael and I stayed with Diane and John for two nights and then with Dina and Sean for four nights before returning home. While I was recuperating Michael attended the funeral of the step-grandmother of the girl we fostered for a few months in 2008. Then he took youth from Umzumbe to youth camp and stayed to teach for two days. Later in the week he went back to camp to bring the youth home again. The highlight of our month was a visit from Bill and Verna Weber, friends and former missionaries in South Africa. They were with us for only 3 days, but we got a lot of talking done in that time! On their recommendation we have reconsidered our retirement plans. We are now planning to scale down the work we do and continue for another few years. We will discuss all of this with our advisory board when we are in the US later this year. The annual conference will be the 1st to 6th of October. Shortly after that we will leave for the US for a few months to visit our supporting churches and individuals. We will stay with our friend in central Minnesota again - as we did in 2013. That will put us near our siblings and in the middle of our supporters. Pray for us as we make decisions about our house and vehicles. It is always a concern to leave the house unoccupied and store the vehicles. We will probably put the house on the market for a few months to see if it sells. If we could get enough from the house we would relocate to a retirement village. Our car is 14 years old and has 249000 kilometers (155000 miles) on it. It is still reliable, but this might be a good time to get a newer vehicle. The pickup is only 5 years old and it is in good condition so it should last as long as we need that type of vehicle. We have had several people approach us asking to buy both of the vehicles. Pray for us as we make these decisions! We attended the Easter meetings in Mtubatuba about 200 miles from home. We stayed with a church family and attended the meetings at a nearby school on Friday, Saturday and Sunday. There was a crowd of about 500 people from all over the province. The people slept and ate at the school. The services were held in a large tent which was set up on the school grounds. Our day care center continues to grow. We started the year with 12 children. Now we have 32 children registered. The newest teacher is attending a pre-school teachers' training course. April was a big birthday month for our family. Sean turned 50 on the 14th. Then on the 26th Dawn turned 40, John turned 34 and Gabriella turned 16. Gabriella organized a Western theme party to celebrate all of the birthdays. It was really fun! Michael spoke twice at the Easter gathering. His interpreter was Mabandla Israel Mfeka, one of the younger ministers. We keep busy with the usual activities - church, school ministry, day care, seniors' club, special meetings, etc. The day care center started with 12 children and, since one of the teachers from last year had left the area, we found another teacher to help. Then more children started to come. When the number increased considerably, we needed another teacher. Then the teacher from last year came back so Michael re-hired her. Michael was told that people would take their children to another day care if the fees were increased. However in a meeting with the parents, they made the decision to make the increase. Amazingly the result was that no one left and even more children came. There have even been some more new ones in the past week and our enrollment is now at 29! They are using the old room for the babies in diapers and the new rooms for the older children. The Marriage Seminar that we mentioned last time had to be postponed because there was a funeral at the church where it was to be held. We have not heard when it will be rescheduled. Since we had planned to go visit friends (Roy and Jenny) in Kimberley after the Marriage Seminar, we decided to go to Kimberley earlier. We spent two days driving there and we stopped on our way to see the campsite where the next Annual Conference is to be held. While we were on the way on Friday afternoon we got a call telling us that Jenny had fallen and broken her wrist. She was in hospital awaiting an operation! So we went to stay with Roy and visited Jenny in hospital. Jenny came home about noon on Sunday. Early Sunday morning Roy went to another hospital and had a hernia operation on Monday. In the end we spent a lot of time driving for Jenny and helping her around the house. We stayed until Wednesday and although it wasn't exactly the vacation we had planned, we were glad to be there when Roy and Jenny needed us. We always enjoy our visits with them! The annual Ministers' Week was held from 5 to 10 March in a rural area about 100 miles from here. We stayed with a family from the church who live a short distance from the church. We had a comfortable room, but the toilet was a drop toilet about 100 feet from the house! The rain made the trip to the toilet in the middle of the night a bit uncomfortable! The meetings were held at the church and meals were served in a tent in the church yard. We were blessed by the worship, prayer times, messages and lessons. The ministers' wives thoroughly enjoyed our study and the knitting and crochet handwork. Thank you Litchfield, Minnesota, for your sponsorship!!! After Ministers' Week we helped some of the ministers and their wives get to their bus transport and then we traveled to the Drakensberg Mountains for a short holiday with Diane, John and Matthew. We were able to enjoy the beautiful scenery and relax. Michael, Diane and Matthew did archery, Michael did a zip line, Diane and I went for spa massages, and we ate and talked! John's activities were limited as he had smashed his thumb the week before which stopped him from playing golf and participating in the archery. Pray for the up-coming Easter meetings which will be held at Mtubatuba which is 200 miles from home. The meetings will be Friday, Saturday and Sunday. Also pray for decisions we need to make over the next few weeks in regard to our retirement. January has been busy with all the activities starting up again. School started for the new year so all of our grandchildren have gone to school. Rebecca is finishing up the exams she couldn’t do last year when the school was unable to get the books she needed for the ACE program. Gabriella is in grade 10 and is a prefect and Erin is in grade 1. They are at Ethan School. Chayah is in grade 3 and Seanna is in grade 0 at the school where Dawn teaches. Matthew is also in grade 0 at another public school. Everyone seems quite settled in their routines. 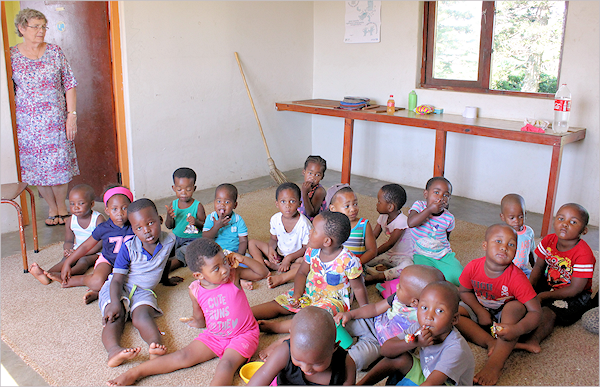 The day care center reopened and we had 15 children in January. The teachers say that more will come in February. The teacher from last year returned, but her helper got another job so we had to quickly find a new helper. She seems to be very capable. We are in the process of preparing a better classroom for them in the office block as the building they are in is in disrepair. The parents who attended the first parents’ meeting are very excited about the move and agreed to an increase in the fees. Unfortunately, some of the moms who couldn’t attend the meeting were not happy about the increase in fees. We are working to find someone who can oversee the crèche when we return to the US later this year. The Magog Senior Citizens’ Club is back in session. They are planning to be a bit more active with gardening, exercising and handwork this year. We have been challenged to make knitted or crocheted blankets this year so I have started knitting my blocks. We have been asked to help with a marriage seminar in the Eastern Cape next month so we are preparing for that. Pray for us. We will take a few days after the seminar to visit friends and have a little bit of a vacation. Recently a teacher who attends the church at Umzumbe took the children who were at the service and taught them a Sunday school lesson. The children were so excited. They love her and she is a very capable teacher. She has asked me to help her with materials for the class. Pray that more children will come to join them. Michael will be turning 70 later this year. He will not be eligible to be elected to serve as Church of Christ Mission treasurer as he has served his allotted terms. We have decided that it is time to look at retirement. It is a scary thought! We have a house and the accumulation of nearly 48 years of marriage and 45 years in South Africa. It seems a daunting task ahead of us! Pray with us as we contemplate this major change in our lives. We will send more details when we know more. Please pray for us as we are planning to return to the US for a furlough toward the end of the year. Obviously November was hectic. I just found the email I had written and never sent to up-date you on our October activities!! Please drop down to the October section and read about our trip to Cape Town for Conference. At the beginning of November we made another trip to Kimberley. Michael had a meeting with the National Executive Committee of the Church of Christ Mission. Unfortunately the friends we usually stay with were away on vacation so we thought we might have to stay in a B&B. However, fellow missionaries, Steve and Brenda Caulley, offered us a place at their home. The other NEC members were staying in the B&B across the road from their house so it was very convenient. Michael had made arrangements for ladies from the local church to prepare meals for them and they held their meetings in the church building. While we were there both Steve and Brenda were sick and Michael was in meetings. I spent a lot of time alone during the days and I was able to do a lot of cross stitch and really relax. 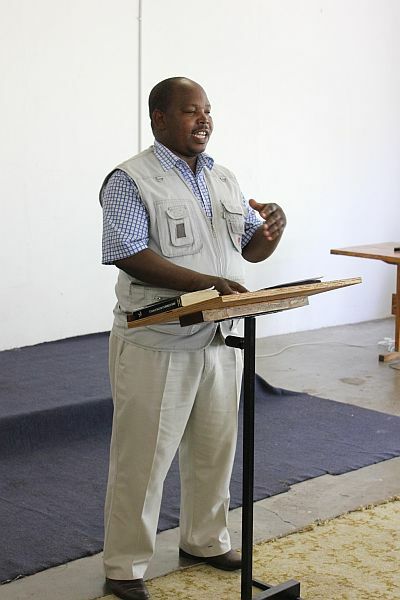 The Umzumbe Church of Christ decided to hold an evangelistic meeting one Saturday evening in November. They hoped it would draw people from the community, but that did not happen. However, several members of the congregation took the opportunity to share messages and we had a good time of worship and prayer. They plan to repeat this in the new year. The Magog Senior Citizens’ Club held their annual Christmas dinner at the Pumula Hotel in Umzumbe. They really enjoyed the buffet dinner and lovely atmosphere. The first week in December we had our final meeting for the year and celebrated the November and December birthdays and Christmas. We had drawn names for a gift exchange. There was much dancing and singing as the gifts were distributed! Michael went to Pretoria for the National Youth Seminar from December 9 to 14. Since he was going alone, we decided he should go by plane. He was able to fly from Margate, which is just 20 miles from our home, to Johannesburg, where a lady from the church met him. There was no seminar last year so we were very happy that the young people from the Gauteng province organized it this year. Although the group was small the seminar was a success. While Michael was in Pretoria I stayed with John. Diane and Matthew. 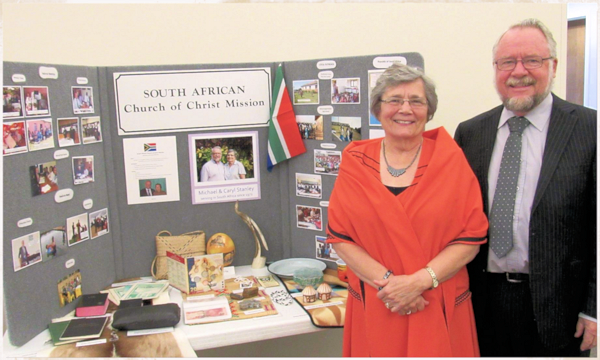 Part of the time Diane was in Cape Town for her final trip as part of Scripture Union. She is involved in writing another Holiday Bible Club (Vacation Bible School) program. The group met to finalize the program for next year. While she was there the staff also said, “Farewell!” to her as she has resigned as of the end of December. We had a very busy week toward the end of November with family activities. Erin “graduated” from Grade R (kindergarten) and we were able to be at her graduation. She will be going to Ethan School next year, which is where Rebecca and Gabriella have been at school for the past few years. The next night we attended the prize-giving for Ethan School. Rebecca got an award for perfect attendance for her entire school career! Gabriella was chosen to be one of the prefects for next year. Prefects are student leaders who are given responsibility for maintaining order and providing assistance in school activities. The next day we attended the end of year concert at Matthew’s school. The preschoolers all participated in the program. Matthew and Seanna will both be going to grade R next year, but they will be in different schools. We wish you all a very Merry Christmas and a happy and healthy 2017!! We are looking forward to worshipping with the Umzumbe Church and then celebrating with the family at John and Diane’s house on Christmas Day! October news from Stanleys All of October is gone and it is past time for us to send you an up-date. Our flight to Cape Town went well. We traveled with two ladies from the Umzumbe church. One had never flown and she was very nervous, but loved it! We stayed at the conference venue in a small cottage with one other couple. While Michael arrange for our rooms, I waited with the luggage. We had been warned that there were baboons in the area and while I was waiting a lady took out a packet of cookies and a baboon came and took it from her and ate the whole packet! We learned to watch for them after that! Sunday was a full day with church, lunch, a lesson, meetings and an evening service. It was great to see people who came from all over the country. Unfortunately, on Monday morning I had another muscle spasm in my back. It pinched a nerve to my leg and I could hardly walk. One of the men from KwaZulu Natal offered his vehicle and a driver so Michael could take me to the doctor. I ended up in bed for most of the week with a muscle relaxant and strong pain killers. I usually help with the collection of money, but the Finance Committee did it this year. We stayed on after the conference so Michael could finish up the finances with the lady who was in charge of buying the groceries. We stayed at a mountain lodge for two nights and with a church family one night before flying home. On Sunday we attended church with a new congregation in the area. They meet in a day care center and are led by an elder. Pray with us as we seek a solution for the Umzumbe Bible Institute property. It is being used for the church, the day care center and the senior club. However, we are finding the responsibility for upkeep quite difficult so we are hoping to find others to take over from us. We have enjoyed some activities with the grandchildren this month. Erin and Seanna were in an end-of-year program for their day-care center. We also spent a few days with John and Matthew because Diane had to go to Cape Town again for work. We took him to school and helped prepare meals for them. Diane has decided to resign from Scripture Union after 21 years. She is finding the travel too difficult so she will finish at the end of the year. They have decided that she will stay at home and help John with their vegetable business. Seanna fell off the jungle gym at day care this week and broke her wrist. She apparently isn't getting enough calcium since she is allergic to dairy products. She is sporting a plaster cast which she will have until just before Christmas. Rebecca, Erin, Chayah and Seanna will be in the end-of-year dance show this week. The school year will end on 7 December. Rebecca will finish school this year and is checking out on some possibilities for next year. I think everyone is looking forward to the break. Well September did not turn out to be more relaxing! Michael was asked to collect the reports from the various groups in the Church of Christ Mission to be made into a booklet for distribution at the annual conference. He has spent many hours tracking down the reports and getting them ready for the printer. Since we are traveling by air it is not possible for us to transport them from here so a lady in Cape Town is making arrangements to have them printed there. Michael sent some of the reports to her early this week by courier and he sent the rest to her by email. I guess the stress was too much for me and I ended up at the doctor with a knotted muscle in my back. After a few days of muscle relaxants and some bed rest I am feeling better. Pray for us as we go to the conference. I am afraid there will be more stress! One of the children from the day care center had sores and they weren't healing. Her mother had taken her and her older sister to a clinic, but the medicine the nurse gave them wasn't helping. About two weeks ago Michael decided to take them to our family doctor. The mother doesn't have money to take them to a private doctor. Now they have had treatment and the older girl is better, but the little one still has sores. So far we have spent over $100 on medical treatment for the girls, but it looks like they will need more treatment. There is at least one other child at the day care center with sores so we may have to have him treated as well. If you would like to help with these medical costs, we would appreciate the help. The local Cancer Relay for Life was held recently. Diane and I have captained a team every year since our local CANSA office started having the Relay for Life in 2011, but this year everyone was so busy that we weren't able to have a team. I was disappointed, but Michael and I went and supported the Port Shepstone Junior Primary School teachers' team which Dawn captained. We enjoyed it and stayed until the end to help her and the others pack up their equipment. Michael and I went and stayed with John and Matthew for most of a week while Diane was in Cape Town for work. We transported Matthew to and from school and played with him when he got home. We also helped cook meals for them. It was quite relaxing and we enjoyed our time with them. We would appreciate your prayers for the annual conference in Cape Town from 1 to 7 October. It will be a busy time and there could be some major changes in the church. Pray that God's Will will be done and that He will speak clearly through the speakers and preachers! 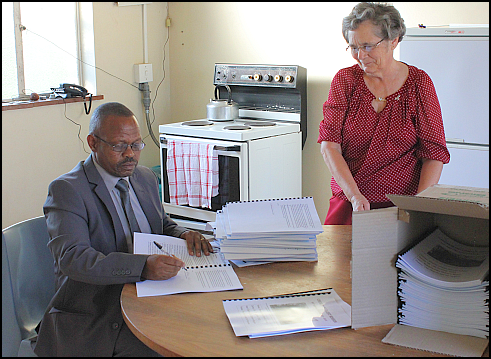 Photo above is Elijah Gontsana, President of the church of Christ Mission signing his report in the booklet at last year's conference. We are pleased to let you know that we managed to get the Church of Christ Mission financial report done before the Cape Town meeting! Michael made the trip to Cape Town on his own. I took him to the main road near our house to meet the minibus which took him to Durban and he flew to Cape Town on Thursday last week. We found out on Monday before he left that the financial committee would be there to go over the report. The only problem they encountered was that we forgot to pack the receipt books! Otherwise they approved the report. The meeting in Cape Town was at times extremely heated. Unfortunately, very few issues were actually resolved, but many issues were brought out in the open and that is a step forward. I stayed with our daughter, Diane, and her family while Michael was away. I had Seanna, our five-year-old granddaughter with me on Thursday because she was sick and couldn't go to pre-school. Friday I went to Matthew's sport day at his pre-school and came home to pick up a few things I forgot to pack. Saturday we all traveled to the Wild Coast Sun for a dance show by several of the local dance studios. Rebecca, Erin, Chayah and Seanna all danced so it was a fun day. I arrived home on Sunday to meet Michael when the minibus brought him back from Durban. September should be a bit of more quiet for us so we are looking forward to a bit of rest before we head back to Cape Town for the annual conference at the beginning of October. My eyes are back to normal and the tingling in my arm is almost gone so I am feeling much better. The weather is warming up so it looks like summer is on the way. Continue to pray for the Church of Christ Mission Executive Committee and the up-coming annual conference in October. My sincere apologies. It looks like June and most of July slipped by and I have not sent out an email. It has been busy! Michael had his angiogram in early June. The good news is that all the grafts done six years ago are open and functioning well. So he is in good health! I have had a couple of health issues. I thought I was losing the vision in my left eye so saw an optometrist who referred me to an eye specialist. The diagnosis was a virus which was in both eyes. Fortunately the eye drops and ointment have done their job and I am back to normal vision. Then I started feeling tingling in my arm. On the advice of the medical members of the family I went to a chiropractor and he diagnosed a pinched nerve in my neck. I have had four treatments and it has helped me a lot. This getting old is not fun!! In mid-June we went to Kimberley because Michael had to attend a Church of Christ Mission National Executive Committee meeting. His meeting lasted from mid-morning until nearly midnight and it was quite stressful. We stayed with our friends, Roy and Jenny Murray. We decided to stay a few extra days to visit and relax. It really was a good break! The youth camp for our province was held at Oribi Bible Camp, just 30 miles from home, at the end of June. Michael helped transport food and then taught for two days. He wasn't able to be there for the whole time as we had to go to a provincial meeting. 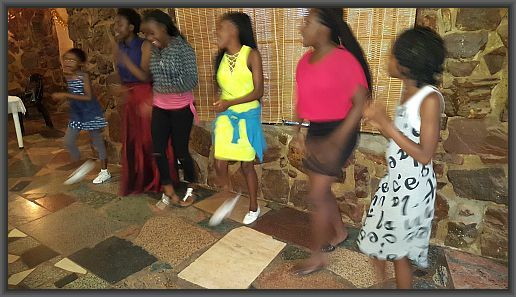 The exciting news from camp is that two of the young people from Umzumbe Church made first-time commitments to the Lord and one of the young ladies recommitted her life to the Lord. We are praising God for His blessing. At the provincial meeting Michael gave a report on the situation in the Church of Christ Mission. I was told after lunch on Saturday that they expected me to speak. Apparently I was on the schedule, but no one had told me. I sat in the pickup and prepared a short lesson which I finally taught about 7 at night. Photo – Syvion Nxumalo, one of Michael’s SABI students, teaching at the 2016 youth camp. We have spent the past couple of weeks working on finances. July is the end of the Church of Christ Mission financial year so Michael is trying to get all the accounts paid. I am helping him get all the records organized so we can get the financial report ready for a meeting at the end of August. In addition to that, we have to file income tax papers in the US for our mission funds and that is due by 15 August so we have been doing those finances as well! Our big dining room table is full of paperwork!! In April Michael (as treasurer) was authorized by the national Church of Christ Mission to purchase a sound system for use by the Director of Evangelism. 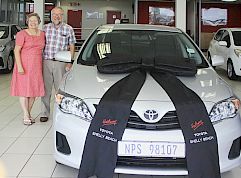 John helped Michael set it up and try it out before he delivered it to Aliwal North on Friday 22 April. It was about a 9 hour drive from home and he made the trip on his own. He attended the evangelistic meeting there and then returned home on Monday. While Michael was away I stayed with John and Diane. No one wants me to stay alone in our house. When I returned home on Monday morning I found that we had had a break-in. Michael had received a phone call in the middle of the night to say our alarm had been activated, but the security company and local neighborhood watch had checked and thought all was in order. When I opened the garage, I discovered that was not true. The burglars had removed roof tiles and pulled the brush cutter out. Fortunately, that set off the alarm and they didn't take anything else! The first weekend of May we traveled to Mtubatuba to attend the wedding of Sipho Nhlenyama, a young man from KwaZulu Natal, who had attended South African Bible Institute when we were teaching there. The next weekend we traveled to Johannesburg to meet with the youth committee from that area. They are planning to host the National Youth Seminar in December and they wanted to show us the campsite they plan to use. It seems to be a good place. Now we need to help them organize teaching materials and teachers. Michael had his annual checkup with his heart specialist this past week. He went through the stress test and then got the bad news. The doctor was a bit concerned about some of the results. He said that since his heart by-pass surgery was over 6 years ago and they can do a lot more now than they could then, he wants Michael to have another angiogram. When Michael said he had some meetings coming up in mid-June and at the end of June, the doctor said he must come in the next couple of weeks. He is tentatively scheduled to go to the hospital on 8 June. Pray that all will go well. At this time we are facing some serious issues in the national Church of Christ Mission. Please pray for Michael and the other members of the National Executive Committee. They will be meeting in mid-June. The annual Ministers' Week was held in Eshowe this year. We stayed with a couple from the church who live in Eshowe. They have dogs that did not allow us to get out of the car unless someone from the family was there to protect us! The rest of the people stayed at the school where the meetings were held and the meals were served. The theme this year was "relationships" and the ministers had well-prepared lessons and sermons on the theme. We had more time than usual for fellowship as well which was a blessing. Just before Easter Bill Weber, a former missionary to Johannesburg who now lives in Cincinnati, and his grandson, Ethan Brooks, came to South Africa. They went to Johannesburg first and then came to see us for a few days. That was a real blessing. The beginning of April we attended the All A frica Missionary Retreat in Cape Town. We traveled to Durban by mini-coach and flew to Cape Town. We stayed in a beautiful hotel which was also the conference center. The worship and teaching were led by a team from Little Rock, Arkansas. That was such a blessing! In the afternoons we went on tours of the area. It was great fun and very interesting! Bill and Ethan were also at the Retreat so we got to spend some more time with them there. Michael and I stayed one extra day after the Retreat and toured Robben Island, which is where Nelson Mandela and other political prisoners were imprisoned for many years. Family news includes injuries to the two youngest grandchildren. Matthew fell out of a tree and cut his chin open. The doctor taped it shut, but he has quite a scar! Seanna fell down a step in a restaurant and hit her head and "shoulder" on the table next to them. The cut on her head wasn't too bad, but after a few days X-rays showed that her right collar bone was broken so she is in a sling for a few weeks. She is right-handed so she is learning to use her left hand for everything now. January was a bit hectic. Michael's cataract surgeries went very well and he is enjoying not needing glasses all of the time. He just has to try to keep track of where he last left his reading glasses as he really needs them for the computer and any papers he needs to read! The urologist recommended surgery immediately for the prostate issues. He was scheduled to go into the private hospital in Margate early on Wednesday (27 January) so we stayed with Diane and John who live a couple of miles from the hospital. We were there bright and early only to be told to sit in the waiting room until a bed was available. After nearly 3 hours the urologist came and told us we should go home and then go to the private hospital in Port Shepstone on Friday (29 January) as it didn't look like there would be a bed that day! On Friday things went very smoothly and Michael was soon settled in his bed and waiting for surgery. The doctor said there were some complications so instead of an overnight stay, he had to stay until Sunday. After we got home in the late afternoon, Michael was not comfortable so he phoned the urologist and we went back to see him. It took a couple of weeks before he was feeling good again, but now he is nearly back to normal. Because of the death of the mother of one of our ministers in KwaZulu Natal, Michael had to postpone his South African Bible Institute extension class. Most of the students went to the funeral. Michael has known this lady since shortly after we came to South Africa, but he was not able to make the long trip to a rural area so soon after his surgery. The class is rescheduled for the 26 and 27 February. 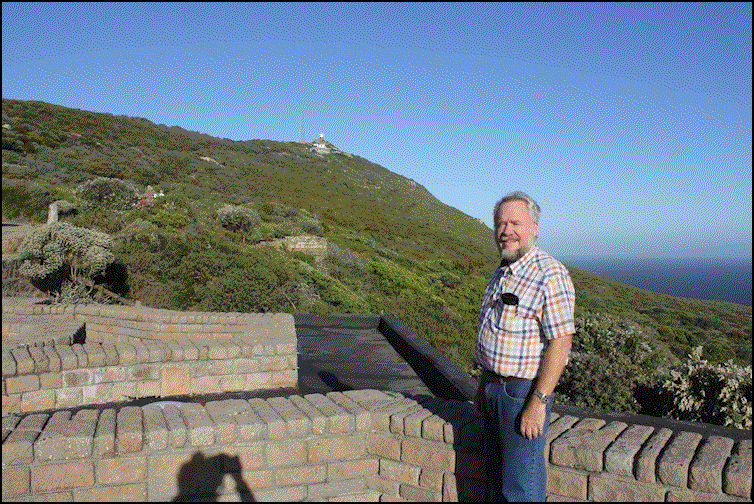 Michael did make the trip to Cape Town for the Church of Christ Mission National Executive Committee meeting. He took a mini bus from here to Durban (a 2-hour trip) and flew to Cape Town (a 2-hour trip). They were able to deal with some issues and discuss a lot of business. The annual conference in October will be in Cape Town so church leaders from the area gave a presentation on their preparations for the event. John has resigned from Toyota after 5 years with them. He, Diane and Matthew are taking a couple of weeks of vacation before he begins his new job on the family farm. Late last year he and Diane started a business called Jolly Fresh. They market quality vegetables which customers can order on-line. They package the vegetables and then deliver them to various business places in the area. Please pray for JP's mother. She had surgery this week for a cancerous brain tumor. The surgeon says he was able to remove most of the tumor, but I am sure she has a long road ahead. I just wanted to let you know about our recent activities. Michael and I both had eye exams late last year and the optometrist suggested Michael have his cataracts checked. We saw the ophthalmologist who said it was time to do the procedure, but said there was no hurry so we decided to wait until January. So on January 12 he had the surgery on his right eye and today (January 19) he had the surgery on his left eye. It is a routine procedure and he was in hospital for about 3 hours each time. He now has great distance vision in both eyes, but he is struggling to read. We will have to see what we can do about reading glasses soon. At the same time Michael has suffered from prostate-related problems. Health issues are beginning to feel a bit overwhelming. He will be seeing the urologist on Thursday to determine the best course of action. Michael has a busy month ahead in February. He will be teaching his South African Bible Institute extension class the first weekend in February. Then he is scheduled to travel to Cape Town the second weekend for a mission executive meeting. It is a very long trip and we are making plans for him to fly there if his health allows him to go to the meeting. Fortunately, I am doing very well as I am now chief driver and care-giver. We appreciate all the prayers and concern. We have been blessed by you who encourage us! First of all, we want to wish you all a very Merry Christmas. May you enjoy the time with friends and family as you celebrate the birth of our Lord! Also we wish you a Happy and Healthy 2016!! We are looking forward to going to Umzumbe for church in the morning and then we will have two days of family celebrations. We will be with Dawn, JP, Chayah, Seanna, Dina, Sean, Rebecca, Gabriella and Erin tomorrow at Dawn and JP’s. John, Diane and Matthew will be with his family. Sean and JP’s families live farther away so they will not be with their families this year. Then on Saturday we will all be together at Diane and John’s house. Tomorrow’s menu is cold meats and salads (which is perfect for this weather), but Saturday will be ham and all the trimmings! All of the end-of-year activities went well and we have enjoyed a bit of a break. We have done some work around the house and some repairs at Umzumbe Bible Institute. We have also done quite a bit of grandchildren-sitting. Dina and Sean were able to go on a weekend cruise so their girls stayed with us. Diane had a major project due so we had Matthew a few days while she worked on that. We had Dawn’s girls when Dawn had to go back to school for a few days after the children were out for the year. What a blessing for us to have our grandchildren so close! For the first time in years I finished all of my Christmas shopping and didn’t have to go shopping on Christmas eve!! Of course, one incentive was an air-conditioned car and air-conditioned shops which were much more comfortable than our hot house!! December has been HOT and humid! Temperatures have been in the 80s with humidity also in the 80s. We have a small air-conditioner in the office and it is relief to sit there and cool off for a while! Again we wish you a very Merry Christmas and a blessed 2016! Everything is winding down for the end of the year. Michael has not been able to do devotions at the high school for a few weeks because it is exam time. Students only come to school when they write exams so attendance is sporadic. Michael was invited to the local primary school early in November to join their Environmental Awareness Program. This will be an on-going commitment. The teachers asked us to participate in the Christian aspects of their school so I have started presenting Bible stories to the grade 7 students each Tuesday morning. We asked to limit it to grade 7s as they have a better understanding of English. Last week was the last one for the year so we showed them a short Christian video for children. It included the Christmas story and they really enjoyed it. We had to use the grade 6 classroom because the grade 7 classroom doesn't have electricity so the grade 6 children also got to watch the video. Before the video ended several other teachers allowed their children to join us. We also showed the video to our Magog Senior Citizens' Club. One of the ladies gave a running commentary in Zulu for those who don't understand English. They loved it and have asked us to bring a video once a month next year. Fortunately we have found several of these videos and they are very inexpensive. Four of our granddaughters are taking dance classes and this week they participated in their end of the year recital with the theme of Peter Pan. Rebecca had one of the lead roles and even had a solo dance. It was such fun watching the girls! We were not able to celebrate Thanksgiving on Thanksgiving Day as everyone had to work and evenings don't work well when it is a school night. The dance shows were Friday night and Saturday afternoon and night so we had our turkey, cranberries and pumpkin pie on Sunday. We were able to have the whole family together. Now we are getting into the Christmas celebrations - Magog Senior Citizens' Christmas dinner at a hotel and then later gift exchange, dance studio prize-giving, school prize-giving, day care graduation, Women's Institute Christmas dinner, and shopping for Christmas. We traveled to Umtata for the annual conference on Friday 2 October. We were able to get our pickup back, repaired and looking like new, that morning so we could drive it. We were able to travel during the day so we arrived in the afternoon. We settled into our room and got ready for the conference to begin. Others also arrived on Friday and more arrived on Saturday and Sunday. In the end we had about 400 people there. Michael organized a card so the food could be purchased without cash. He still had to do some running around for food, but not nearly as much as in previous years. At the end of conference he had to sort out some issues with food before we could come home, but all in all it went quite well. The conference theme was "The church and its purpose." There were some really good lessons and messages presented by various ministers. The worship times were encouraging. As usual there were some adjustments to the schedule. The night Michael preached supper was very late and most of the people went to bed after supper instead of attending the service. On Wednesday morning when we got up we were told that Mrs. Maart Joseph, a minister's wife, had passed away in the night. She suffered from asthma and that was apparently the cause of her death. Her funeral will be this Saturday (17 October) in Graaff Reinet. We have known Maart and Winnie since they were Umzumbe Bible Institute students in the 1970s. We will leave tomorrow morning and take two days to drive to Graaff Reinet to attend the funeral and then we will take two days to drive back home. Pray for safety as we travel and for the Joseph family at this time. The members of the finance committee and I collected the money that people brought to conference. Some of the money was deposited in the bank, some was used to pay accounts at conference and we brought some home with us. This week Michael and I have been sorting out the money and depositing more of it into the bank. We are looking forward to next week when we will return home and settle for a while as we do not have any more travel plans in the near future. As we will be leaving for the Conference in Umtata at the end of next week, I wanted to get a message off to you before we leave. Our meeting with Thulani, the young man who has helped us with finances, was short but profitable. He arrived on Saturday morning and left again on Saturday evening. Michael and I spent a few more hours during the next week finalizing the report to be presented at the Conference. We sent it to Thulani and he agreed that it is ready to be printed. Another member of the Executive Committee was supposed to collect, print and assemble the reports into a booklet, but the job has been handed over to Michael. He has most of the reports now, but needs to retype some as they were sent by fax and came through with black streaks! Michael will take the reports to a printing company on Monday and collect them toward the end of the week. We plan to travel to Umtata on Friday (2 October). Our pickup is still at the repair shop and will not be ready in time for our trip to Umtata. Our insurance provides for a rental vehicle for 31 days and that time will expire while we are away so we will have to extend the rental. Pray for us this coming week as we prepare for the trip, as we travel and then for all who are involved in the Conference. We have had reports that Umtata is rife with robberies and hijackings. Pray for safety for all of us who will be there for the Conference. The meeting of the Executive Committee and church leaders was held on the 4th and 5th of September at Umtata - about 200 miles from home. We worked on the financial report, but did not get it all done. Michael even worked for a while on Thursday morning before we left. We stopped in Port Shepstone to get some of his materials photocopied on our way. That meant that we were traveling after dark which we do not like to do. At 6:30 at night about 40 miles from Umtata we had an accident. We hit a horse that was standing in the road. Fortunately, we were not injured at all! Michael pulled to the side of the road to assess the damage. He couldn't get his door open so he climbed across the seat and found that the hood, right fender, headlight and rear view mirror were damaged. Some plastic was against the wheel, but the tire was fine. We contacted our children by phone and John said he would organize a tow truck for us. The tow truck owner contacted us and advised us to go to the little town we could see from where we were. We tried to contact police and about an hour after the accident we drove slowly into the town and parked at a gas station. Three of the ministers who were already in Umtata came to us and helped Michael report the accident at the police station. Then the tow truck came, loaded up our pickup and drove us to the school for our meeting. On Friday they brought our vehicle back to Margate, about 20 miles from our home, for repairs. I contacted our insurance company and they organized a vehicle for us to use. It was delivered to us on Friday afternoon. Unfortunately, it was a pickup with no topper so we had to drive home with our luggage in an open vehicle. Theft from open vehicles is quite common. Michael spent Friday and Saturday morning in meetings. The meetings were quite stressful. There are a lot of problems and there is a power struggle going on. Pray for the church in South Africa. We really need a spiritual revival! On Friday I met with two ladies who are accountants and they went over our financial records. They found everything to be in order and I felt they were very helpful! By Saturday afternoon everyone had gone home, but Michael and I stayed one more night. We were able to go for a walk and relax. On Sunday we loaded up our luggage, attended church with the local minister and then drove home. On Monday we went to see the vehicle in daylight. 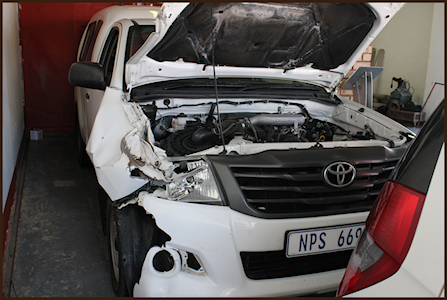 It can be repaired and the repair shop has assured us it will be like new. We just don't know how long it will take to get the work done. On Tuesday we were able to exchange the open pickup for one with a topper. We will spend the next three weeks finalizing the financial report and getting ready for the annual conference which will be in Umtata from October 4-9. A young man who has helped with the finances for the past few years will be coming to help us prepare the final report. Pray for us as we prepare for Conference and also for the Christians who will be traveling from all over the country to attend. We are back home after a wonderful holiday in the USA! We stayed with my sister, Juanita, in Lakeville, MN. Since all of our siblings live in or near the Minneapolis/St. Paul area, it was convenient to get together. What a joy that was! We were able to enjoy family gatherings, family reunions (one in Tennessee which involved a long car ride and a bit of sight-seeing on the way), a Twins game, a recording of Prairie Home Companion, a live theater performance, a trip to Washington, DC (mark one off the "bucket list"! ), my step-mom's 95th birthday party, and lots of shopping and eating and laughter! We thank the Lord for the opportunities we had and for safety in all of our travels. We are also most grateful to God for protecting our house while we were away. We have enjoyed seeing our daughters and their husbands and the grandchildren since we got back. Everyone is busy, but we have been able to get together a couple of times. Dawn and JP moved into their new house just before we got back. They are loving it. Two ministers have passed away in the past two weeks. One of the men was a fairly new minister. He had been ill earlier this year, but had recovered. Unfortunately, he had cancer and passed away a few days ago. The other man was 97 years old and was no longer able to be active in ministry. It reminds us how important it is to educate some younger men for ministry. Pray for laborers for the harvest! Pray for us. A meeting of the executive committee and other church leaders of the Church of Christ Mission was scheduled for this coming weekend, but because of the funeral of the older minister, it has been postponed to the first weekend in September. Michael needs to present his financial report at the meeting so we have been trying to get work done for that. Unfortunately Michael is not feeling very well. He got a boil on the back of his neck and it developed into a carbuncle. He is on antibiotics and pain medication. I have become a nurse and it is really not my calling! I am not sure what has happened to me this year, but it seems that I have not been keeping up with emails to up-date you. My apologies! I am not sure where to start. We had a busy time in April with Ministers' Week right after Easter. It meant being away from home for 11 days. There was a large attendance at the Easter meetings in the far north of KwaZulu Natal. A bus traveled from the southern part of the province with a lot of church members. There was good worship and fellowship. 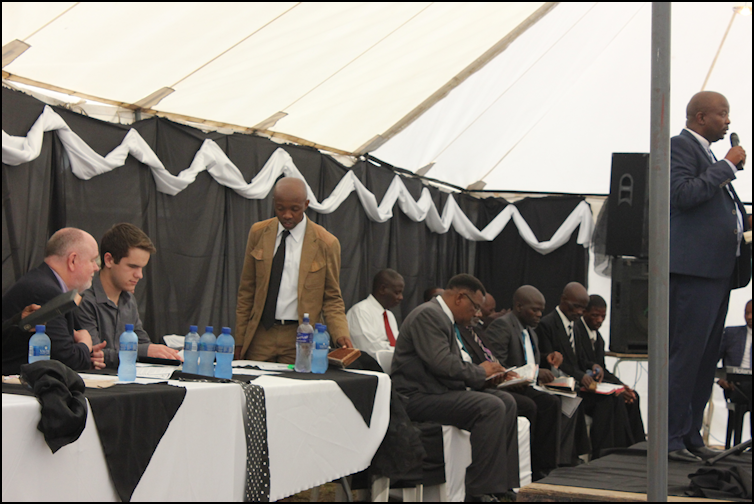 Ministers' Week was held in White River where Brother Mkhundlu preaches. We were impressed with the growth of the church there and with the good cooperation we saw amongst the people as they cared for us that week. We enjoyed getting together with the ministers and their wives that we have known for a long time and getting to know some of the younger ministers and their wives. It was a good week! We spent most of May getting ready for our trip to the US. We have to submit personal tax forms in South Africa and personal and mission tax forms in the United States. Because we live overseas our US tax forms are due later, but we needed to get them done before we left. Michael had to organize some things related to his treasurer's responsibilities and we had to organize our own finances for while we are away. It kept us busy right to the end! We are in the US now for a personal vacation! When we are on furlough we are usually busy on weekends when our brothers and sisters and their families can get together so we miss a lot of those activities. We decided to come on a personal trip so we could spend time with our siblings, see my step-mom who will be 95 in August and do some fun things. We left South Africa on June 10 and will return on August 6. Diane took us to the airport in Durban and we flew to Cape Town. Dina was there for a work course so she met us at the airport and spent a few hours with us during our layover. Then we flew to Amsterdam and on to Minneapolis. We were met by Michael's brother, Duane, and his wife, Kathy, my sister, Sharon and her husband, Dave, and my sister, Juanita. We are staying with Juanita while we are here. We met with Michael's brother, Larry, the next day and he loaned us a car to use for a week while he is away on business. So far we have attended a funeral of an old friend of my family - my dad's lifelong friend. We have also attended a Minnesota Twins baseball game, eaten out a few times, taken care of some business and done a bit of shopping. We are amazed at the variety and abundance of the stores! We really don't know how to choose from so much! We will be attending a Stanley family reunion in Tennessee next week, a Westfield family reunion in Southwest Minnesota in mid-July and trying to see some friends and family wherever possible. Pray for us as we travel. Also pray for those we have left behind in South Africa - our children and grandchildren, our church family, our Seniors' Club, the day care center and our home. I have not been able to access my email groups this week so I am sending this email to nearly everyone on my address list. Please let me know if you want to continue receiving this monthly email from us. I am not sure where the first two months of this year have gone. I thought I had sent an email at the end of January, but I have not been able to locate a copy of it so I assume I did not send it. The day care center reopened in mid-January. We have 12 children registered. Our teacher has been able to complete her training with Brain Boosters. She loved it and we have certainly seen her using what she has learned. The children will benefit greatly from the training! The Seniors’ Club also resumed in January. We celebrated the January and February birthdays at the end of February with the usual party and big meal. Some vegetables have been planted and there are plans to resume the sewing. The Club is certainly meeting the social needs of the elderly in the community as they really enjoy getting together. Michael had to make a trip to the Eastern Cape in January. The Executive Committee had planned a meeting and then Conrad Sauls, one of the ministers from that area, was killed in a car accident so they attended the funeral and held their meeting the same weekend. Michael had a very tiring trip as he had to do all the driving. On his way from the funeral to the meeting, he missed a turn and ended up driving a long way out of his way. The fact that it was late at night made the trip even more harrowing! The Executive Committee of the Church of Christ Mission at their meeting in Jan to discuss plans for 2015. 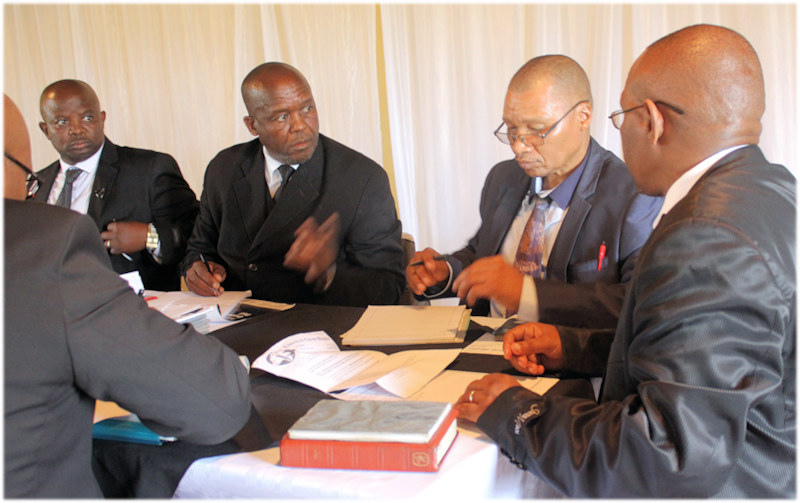 The meeting was held after they attended the funeral of Conrad Sauls, a minister, who had been killed in a car accident. I was asked to be one of the three speakers at the national Women’s Workshop in early February so Michael and I went to Bloemfontein. The attendance this year was about three times what it has been in the past. I was told it was because they had invited a radio personality to be the speaker on Friday night. Hopefully, the ladies who came to see her also learned from the lessons on Saturday! 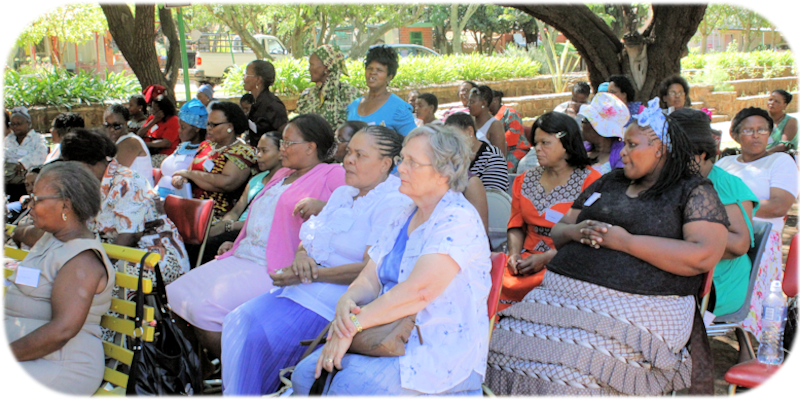 The hall was not big enough for the crowd that attended the Women’s Workshop in Bloem-fontein so the ladies set up the chairs under the trees. As the day wore on chairs had to be moved to stay in the shade. When the meeting ended on Sunday morning we drove to Kimberley so we could see our friends, Roy and Jenny Murray, and co-workers, Steve and Brenda Caulley. Steve and Brenda both had major surgeries recently and will have extensive recovery periods. Brenda had surgery on her shoulder in November and Steve had surgery on his foot in January. 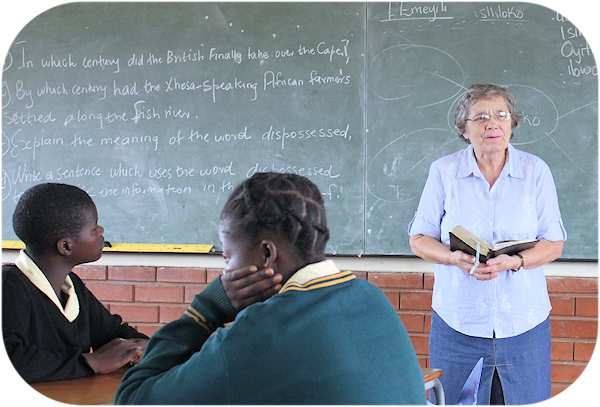 Michael has held one session of South African Bible Institute extension classes this year. Unfortunately Mabandla, the other teacher, wasn’t able to be there so Michael had to teach both classes. One of the students also was unable to attend. Their next session will be next weekend. Pray for Michael and Mabandla as they teach and for the five men who are registered for the class. Please pray that the men will all be able to attend this time. We have been told that there are others who are interested in joining the class in the future. The family is doing well. Chayah started grade one this year. We have done some babysitting for the little ones. We had Seanna for a few days when she wasn’t able to go to day care because she was ill. We had Matthew when Diane had to go to Johannesburg for work. Those three year olds keep us on our toes!